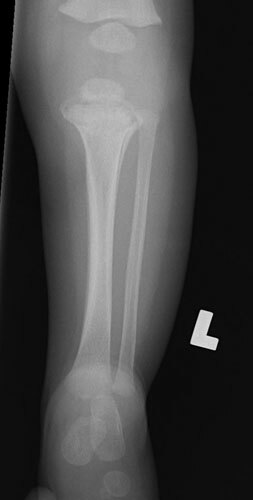 A 4-month-old infant presents to the Emergency Department with a fractured left humerus. The skeletal survey reveals the additional finding demonstrated in this radiograph. There is no history of previous injury, the child has had good mobility of his extremities prior this and the birth history indicates a normal delivery. Which of the following is a true statement regarding this injury? This is a classic metaphyseal lesion and it is suspicious for trauma. This finding of unilateral subperiosteal new bone formation is a normal finding. This is a normal finding associated with subperiosteal new bone formation. A nuclear bone scan should be performed to best demonstrate this finding.